A Side is Good Rockin' Tonight. B Side is I Don't Care If The Sun Don't Shine. Elvis's second release on Sun Records. Released on September 25th 1954. Vinyl is in VG+ condition. Numerous light marks on both sides. No cracks or chips. Some pressing dimples. Both labels are in very nice shape, see photos. 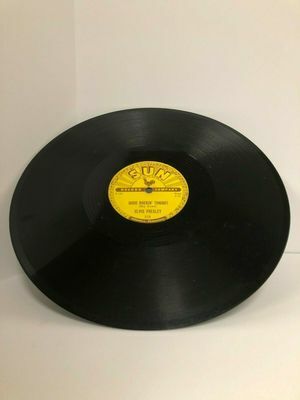 Generic 78RPM sleeve. All records are visually graded to the unless otherwise stated. Please ask questions before buying / bidding. All sales final.